Welcome to all the great folks I’ve met at The Farm Cooking School as well as my other foodie friends! Here’s the fabulous Lincoln-Mercury video featuring The Farm Cooking School with narration by Chef Knauer and a cameo (in the red shirt) by your humble author. Note: The Farm Cooking School is now located at Gravity Hill Farm in Titusville, NJ. Click here for a map. Published recipes – recipes that the cooking school published on their website. Resources page – lists of local CSAs, farm stands and markets, ethnic markets and other things of interest to local foodies. Resource map – a map containing the items on the resources page so you can see what’s near you. BYOB’s – restaurants without bars that permit you to bring your own alcohol. 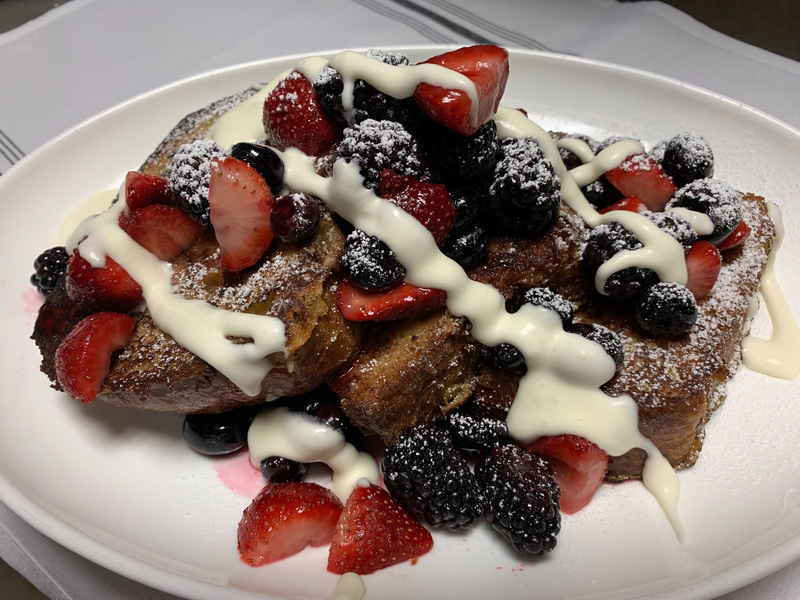 Daily specials – dining specials for local restaurants. It’s pretty tough to keep these up to date so please post comments about others you know about or changes that may have occurred. Remember to join our Facebook group: Dining Along the Delaware for the latest info. Note: ad blocking software seems to prevent loading the photo albums so if you want to view the albums, you have to disable ad blocking. 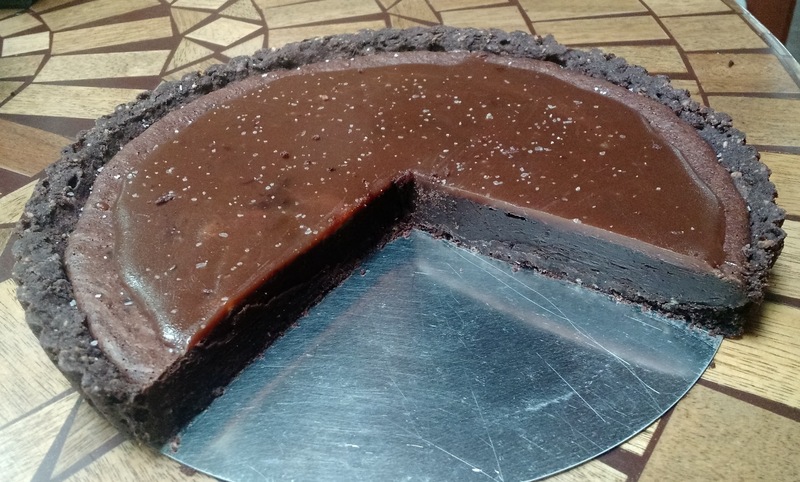 In this version of the chocolate tart, I changed a few things to adapt it to my tastes. Added very finely ground coffee. Just because chocolate desserts are better with coffee. Be forewarned – this is a *very* potent dessert! For maximal enjoyment I suggest slender slices. You should be able to get 12-16 (correction) 24-32 slices from this tart! You may also wish to eliminate the caramel. I keep going back and forth between desiring its added flavor and being overwhelmed by the extra sweetness. Where oh where to get your cook ware? Cookery Ware in Lahaska! In my quest to find and bring you all good things related to food in the Delaware River region, I decided to change course from my normal restaurant hidden gems and found myself at the Cookery Ware Shop in Lahaska / Peddler’s Village. I “discovered” this hidden gem a few years back when I was looking for some cast iron pans. What I found was an amazing collection of essential items for chefs of all levels, from the beginner to the seasoned professional. In this day of instant Internet gratification, it’s so easy to just click a button and place an order that I often forget about local retail stores. But when it comes to items for my home, there’s nothing like putting my hands on them. If I’m buying a knife for potentially hundreds of dollars, I want to feel the curves of its handle and feel its heft. I want to see its exact shape and size. Do I need a 6″ or 8″ blade? I need to handle it to see what’s right – something I’m not going to get from the Internet. For items like these that I’ll use constantly, I want them to be “just right.” That’s where the Cookery Ware store comes in.